A former INS quarantine station off the coast of Honolulu, O’ahu was converted into the Sand Island Detention Center in World War II and overseen by the US Army. After the attack on Pearl Harbor, martial law was declared in Hawaii. From December 1941 through February 1942, men and women of Japanese and German ethnicity, both aliens and US citizens, were housed here. 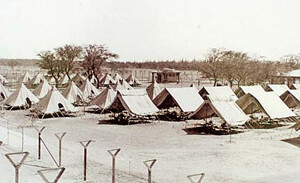 Small tents without floors were later replaced by newly built barracks. Eventually married men were reunited with their wives, and each couple was assigned a tent. There were two latrines, one at each end of the camp. Meals were served in a large communal mess hall. Sand Island Internment Camp, Resource Center of Japanese American Cultural Center Photo. As in other internee camps, high barbed wire fences were erected around the five acre site, and were patrolled day and night by military guards with rifles. Internees were not allowed paper, pens or pencils, so were unable to keep in touch with family left behind. There were some opportunities to work, for a salary of 10 cents an hour. To alleviate boredom and attempt to beautify their surroundings, some of the internees dug up beach grasses to plant around their entries. Considered a temporary facility, detainees were taken to Honouliuli in leeward O’ahu on March 1, 1943.